The royal wedding has officially come and gone — but not before Prince Harry and his beautiful bride dazzled the world with their stunning vows and valuable accessories worn from head to toe. Though Meghan Markle’s dress, designed by Clare Waight Keller for Givenchy, brought elegance and a modern flare, the real statement was made through her jewelry, as NYC designer Katharine Polk predicted earlier this month. If you were impressed by that coveted Meghan Markle wedding ring — or Prince Harry’s — there’s a way to get ones of your own inspired by the real thing. "Meghan went with an all-diamond ensemble of accessories across her tiara, bracelet and earrings," Josh Marion, diamond expert and vice president of New York-based luxury jeweler Ritani, said in a statement sent to Metro. Whether you’re craving the Meghan Markle wedding ring, her engagement ring or Prince Harry’s band, these Ritani hand-crafted look-alikes will make you and your spouse feel like you're fit to live in the Kensington Palace. 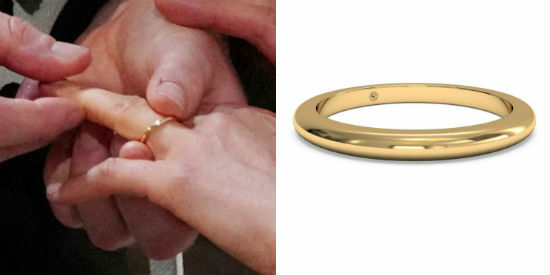 Marion explained that Markle’s wedding band "is a delicate, thin, yellow gold band — made from the family’s Welsh Gold collection — to match her engagement ring [made of yellow gold]. It’s a classic look for the new Duchess of Sussex." For a similar band, Ritani offers this 18kt yellow gold "thin classic" ring at $380. "While his brother and many other male Royals chose not to wear a ring, Harry is wearing a platinum ring with a textured, sophisticated finish," Marion stated. "His band is also platinum and not Welsh Gold, which runs contrary to royal tradition…"
Marion went on to note that, "by both having bands," Prince Harry and Markle are "honoring the tradition of marriage." But, the fact that his band does not match the famed Meghan Markle wedding ring is "very modern." Ritani offers this similar design: a 7MM Satin-Finish Comfort-Fit platinum wedding band at $1,650. Prince Harry said during their first official interview as an engaged couple back in November that he chose yellow gold for Markle's engagement ring because it's her favorite, "and the little diamonds [on] either side are from my mother's jewelry collection, to make sure that she's with us on this crazy journey together." Marion said that Ritani customers "have been craving the elements of Meghan’s engagement ring from the moment she and Prince Harry were engaged." "Her engagement ring is the stunning three-stone design set in yellow gold with a 3 carat center stone from Botswana, flanked by two round stones which belonged to Princess Diana," he explained. "In the month after the engagement, sales of three-stone engagement rings, yellow gold rings and cushion cut diamonds are all significantly up." 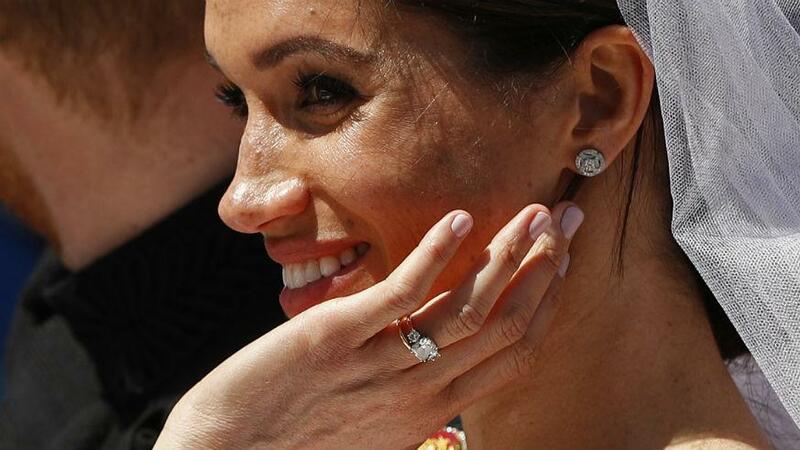 Marion estimated the cost of Markle's band to be at least $250,000, "however the diamonds from Princess Diana's collection could render this ring absolutely priceless." He said that Ritani, "inspired by these trends and Harry’s design choice," created the "Royal Crown" design, an 18kt yellow gold three-stone diamond engagement ring, for $3,410. Marion noted that it mirrors Markle’s "stunning" band so that "you too can have a Royal-worthy ring."